Florida Gator’s defensive tackle Caleb Brantley was a key part of a defense which led the Gators to the SEC title game in 2016. Brantley finished 2016 with 31 total tackles, 9.5 for loss, and 2.5 sacks. He is listed at 6’2 314 pounds, and is currently slotted in the first round of many reputable mock drafts. Brantley is one of the top defensive linemen in the 2017 NFL Draft class, let’s take a look at the tape to see why this should, or should not, be the case. Caleb Brantley doesn’t have a massive build, but he certainly makes the most of what he’s working with. He is very powerful for any size, but especially for his size, knocking back offensive linemen with his strong hands and initial punch off the ball. Brantley also possesses a quick first step, which helps him to beat bigger linemen inside. As we can see here against Florida State, Brantley is able to stone offensive linemen by getting hands on and driving his hips through contact. He does a nice job of keeping his hands above his eyes, bending at the knees, and maintaining leverage throughout the play. After driving the guard two yards deep into the backfield, Brantley further uses his upper body strength to shed the blocker and make the tackle. Brantley consistently shows the ability to shed linemen both against the run and pass. Here we see Brantley’s ability to use quick hands to break the hands of the guard and win when pass rushing. Brantley’s hand technique is very good, with the ability to win with both a quick swim and rip move inside. He also keeps his hands active through the whistle, never giving up on a play and playing with a high motor. Caleb Brantley also does a good job of taking on, and splitting double teams. Rarely do I see him get blown off the ball by a double team, keeping his ground and creating piles when necessary to keep the linebackers clean. Here we see Brantley’s quick first step, and ability to split a double team in action. Yes, this was a mistake on the offensive linemen’s part, but Brantley’s traits are still evident, as he gets quick and skinny through the line. As mentioned earlier, Caleb Brantley plays with an incredibly high motor, playing through the whistle on every snap. While this is certainly a strength, it can also be used against him, leaving him susceptible to counter plays and trap blocks at times. Brantley’s pad level is a problem at times as well. At 6’2, Brantley should be able to stay low to the ground and out-leverage bigger guards, but he will sometimes get too high, opening up his midsection against tackle down blocks. Here is a perfect example of this pad-level problem. Brantley comes off the ball high, allowing Alabama’s Cam Robinson to complete a vicious down block, and take Brantley out of the play. This play also speaks to a bit of a larger problem. Brantley will need to add some bulk if he is going to play 1-technique or nose tackle in the NFL. This is exactly why I like him more as a 3-technique, even if he has shown the versatility to play both positions. 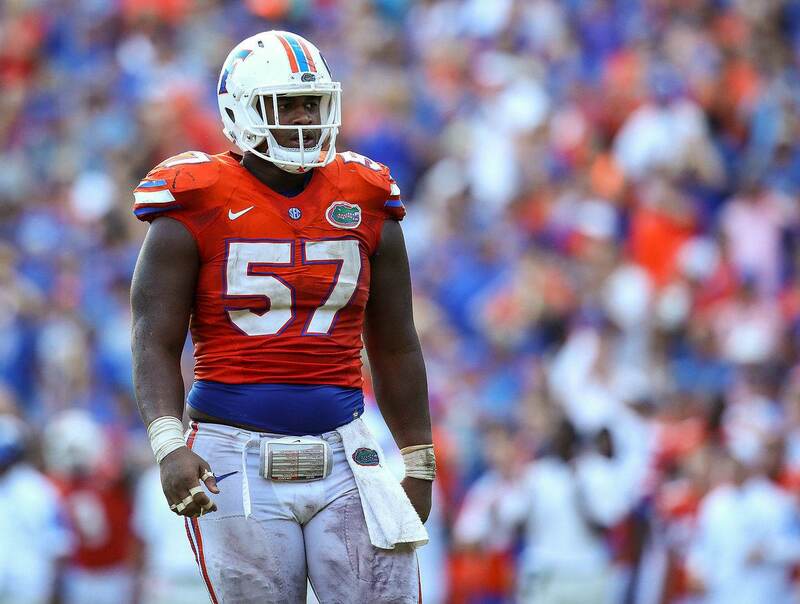 Caleb Brantley is a top 5 defensive tackle prospect in this draft. If selecting in the back-half of the first round with a defensive tackle need, I would certainly consider taking Brantley there. I could see the Atlanta Falcons and Oakland Raiders being ideal landing spots for Caleb Brantley this April. Brantley goes onto my board with a late first/early second round grade, coupled with Iowa’s Jaleel Johnson as the fourth and fifth defensive tackles in this year’s draft class.